In this article, we have disclosed 25 questions from Elementary mathematics section of SSC GD Constable 2015 exam held in evening shift. find all questions..
2. A man rows 750 m in 600 seconds against the stream and returns in 7 &frac12; minutes. Its rowing speed in still water is (in Km/hr). 3. Ram bought a bike for Rs. 60,000. He paid Rs. 10000 cash down and the rest at the end of 2 years at 15% simple interest. How much more did he pay as simple interest? 5. Six friends have an average height of 167 cms. A boy with height 162 cm leaves the group. Find the new average height. 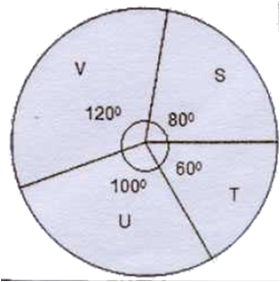 Directions: The following pie-chart shows the market share of four companies S, T, U and V. Total market is worth Rs. 72 crores. Study the pie-chart and answer the questions. 6. The difference of market shares of companies V and U is? 7. The company having maximum market share is? 12. What should be the least number of years in which the simple interest on Rs. 2600 at 22/3% will be an exact number of rupees? 17. 8 children and 12 men complete a certain piece of work in 9 days. Each child takes twice the time take by a man to finish the work. In how many days will 12 men finish the same work? 19. A scooter is sold at three successive discounts of 10%, 5% and 2%. If the marked price of the scooter is Rs. 18,000, find its net selling price. 21. A 200 metres long train is running at a speed of 72 Km/hr. How long will it take to cross 800m long bridge? 22. A certain number of men can do a work in 40 days. If there were 8 men were there initially? 24. A man allow a discount of 10% on a book whose marked price is Rs. 40. What is the cost price so that the profit is 20%?